An orchard of 36 half-standard fruit trees planted in 2005. 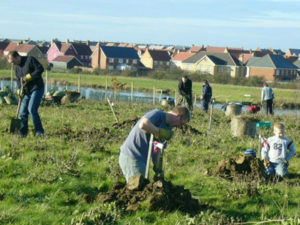 The Wildlife Trust for Bedfordshire, Cambridgeshire, Northamptonshire and Peterborough established the orchard with help from local residents. The developers had pulled the plug on funding the orchard when the development was completed so local residents donated money for the trees. The Wildlife Trust is responsible for management which is carried out organically with wildlife in mind. Pathways are mown, a wildflower mix has been sown, insect homes installed, fruit blossom attracts insects, deadwood attracts invertebrates, and there are breeding birds in the hedgerows. When the trees begin to crop well, the fruit will be left for local people to collect. Preparation and planting days have involved local people and further community events are planned. An old traditional orchard on land behind the recreation field, owned by the parish council and managed by Cambridge Green Belt Project with help from local volunteers. The old trees are thought to be Bramleys and Laxton Superb apples, with a distinctive habit, branching fro the base. New plantings will be chosen to complement the existing trees. The orchard has meadow, scrub and hedgerows, all managed for people and wild life. The meadow is cut for hay annually and there are bee orchids and common spotted orchids present as well as meadow sweet, wild basil, agrimony, kidney vetch, lady’s bedstraw, cut-leaved cranesbill and self heal. A moth trapping event revealed that over 100 species use the orchard including elephant hawk moth, privet hawk moth and the buff tip. Some of the scrub has been cut back, revealing two more old trees in 2003. There is full public access. This is the newest community orchard in the County. The aim of the orchard is to produce food for local people, improve biodiversity and habitat for wildlife and plants, maintain a green space within the allotment envelope and help combat climate change. Our concern was to protect this site from housing developments or the guided busway. Rubbish from many years of fly tipping has been removed and the site has been fenced in order to discourage further tipping. In the last few years bird and bat boxes were placed and the hedgerow was completed. Nineteen Cambridgeshire apple trees and two plums have been planted, representing the full range of heritage fruit trees for Cambridgeshire. 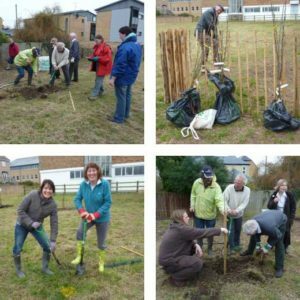 Did you know that there was a community orchard right in the heart of Cambridge? Located on the edge of the Common, near Newmarket Road is a relatively recent orchard planted with an eye to supporting and extending the biodiversity of the Common. Beginning with an initial planting stage of 15 apple trees, the orchard now includes pears, plums, gages, and quince. Subsequently, a new hedge along with a variety of wildflowers and some soft fruits have also been planted in the area.